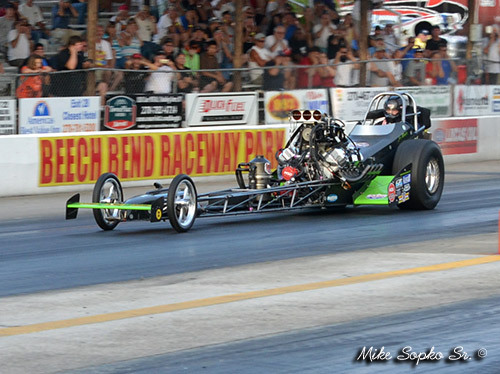 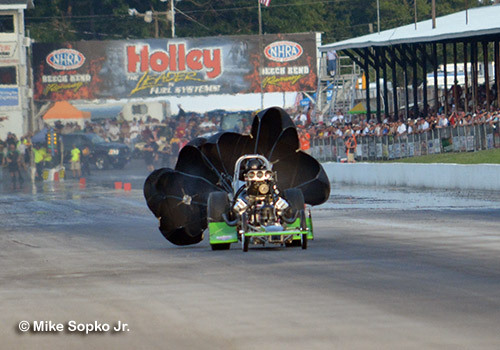 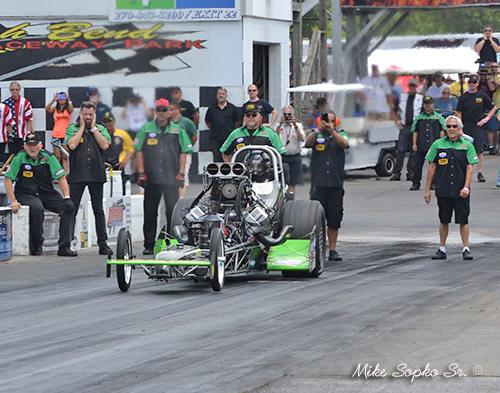 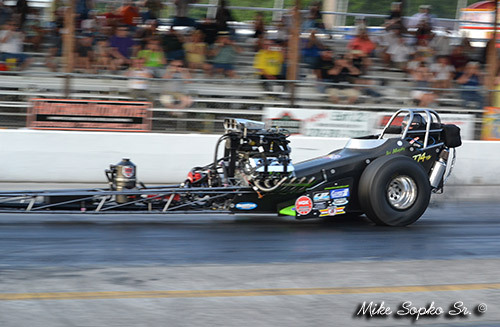 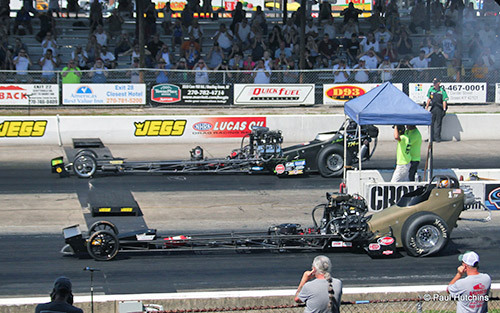 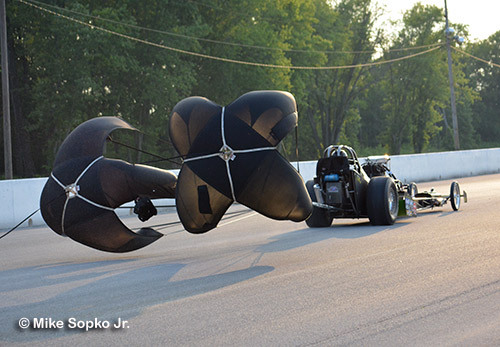 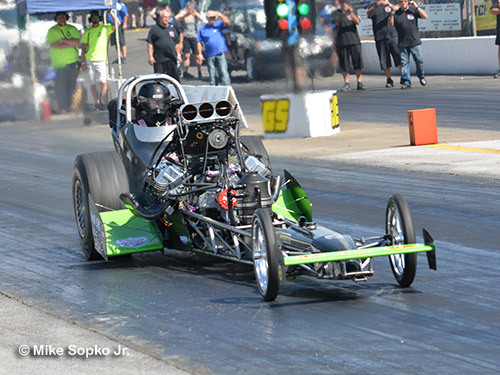 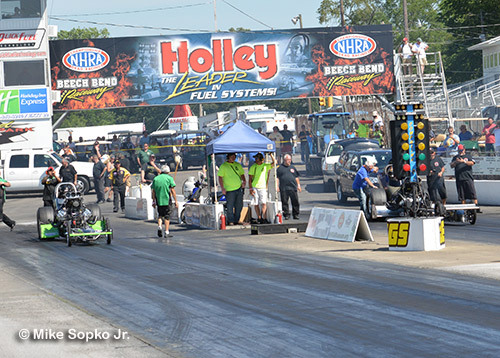 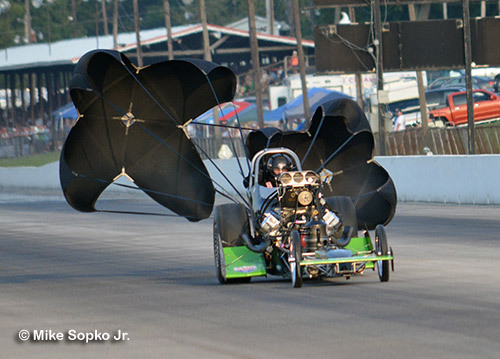 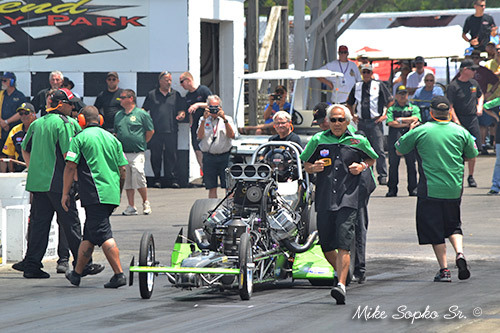 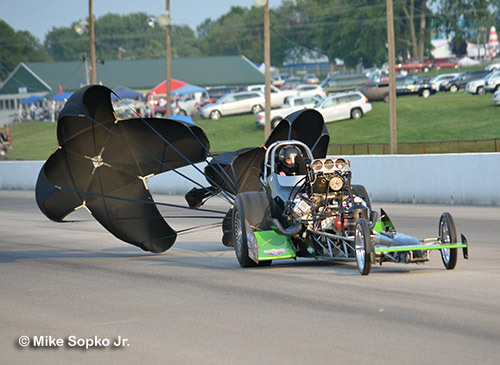 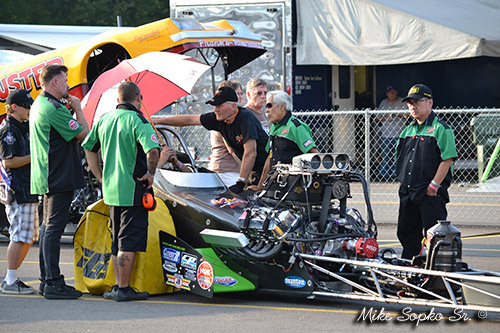 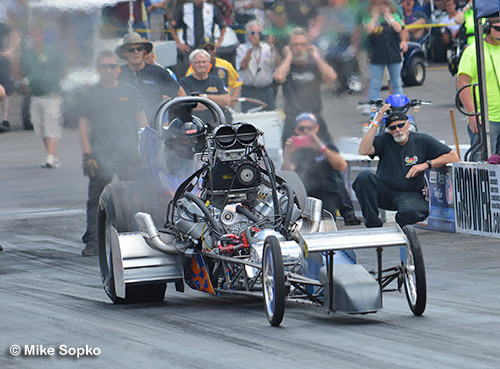 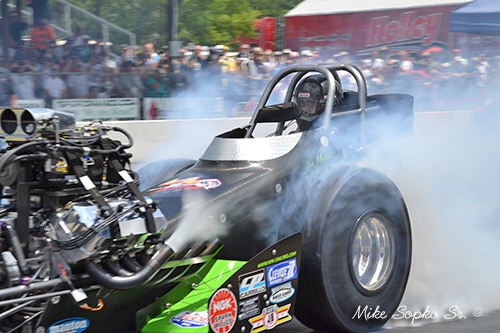 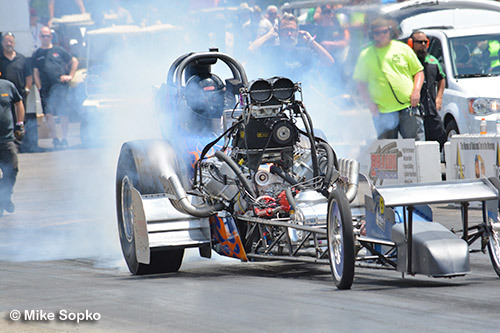 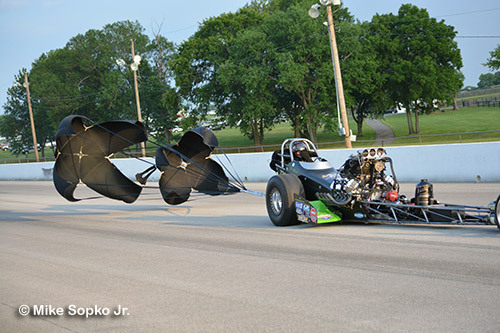 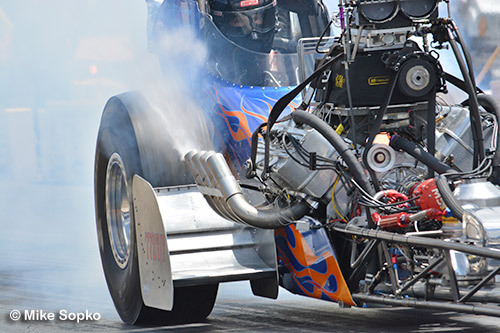 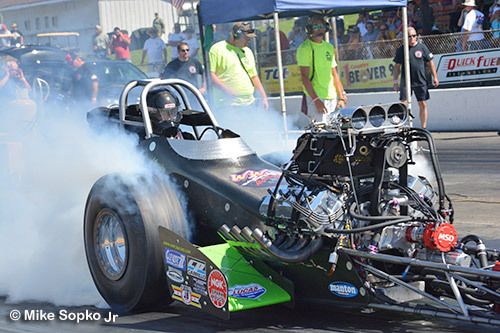 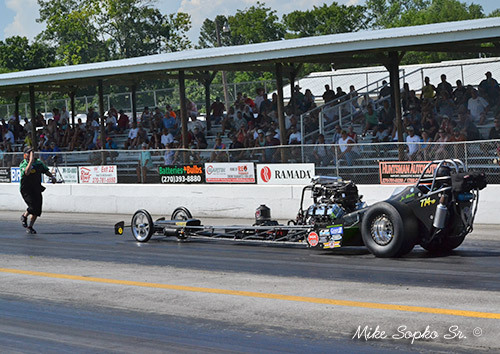 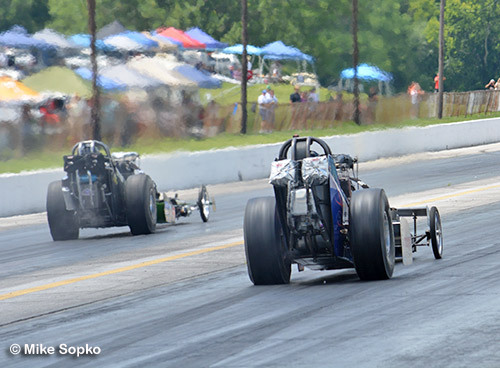 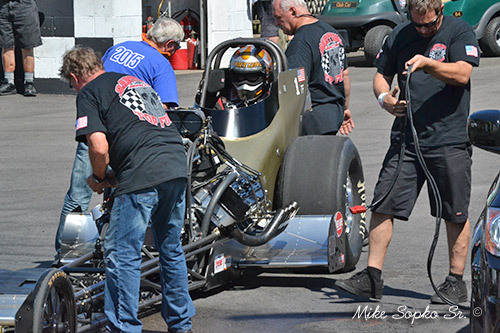 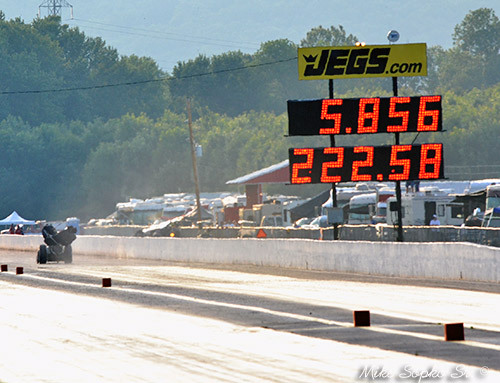 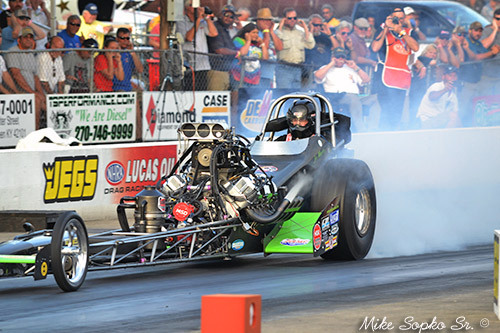 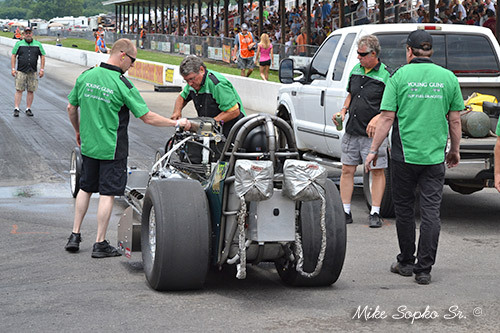 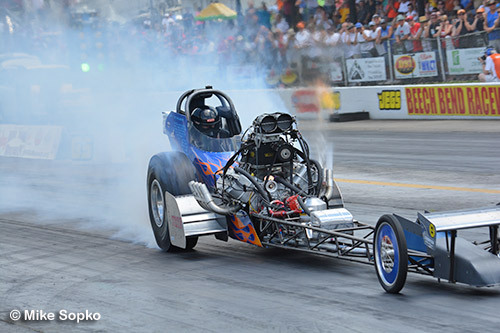 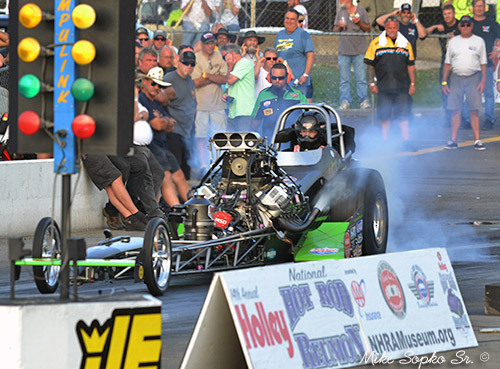 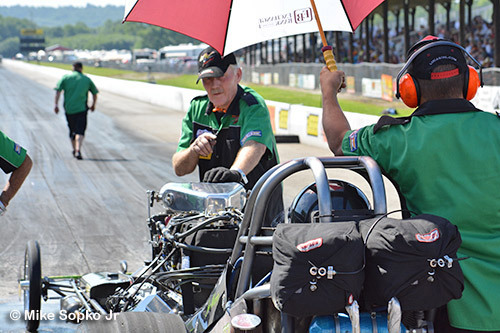 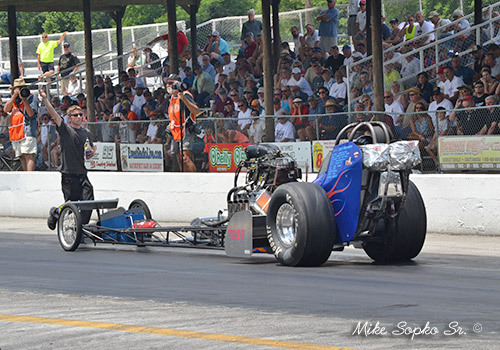 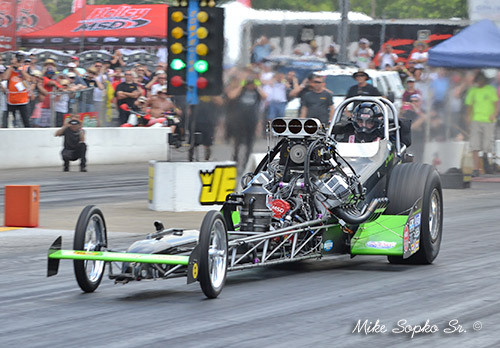 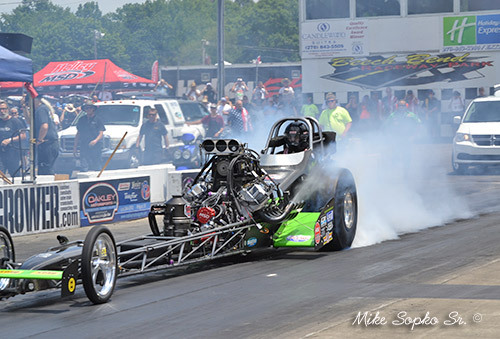 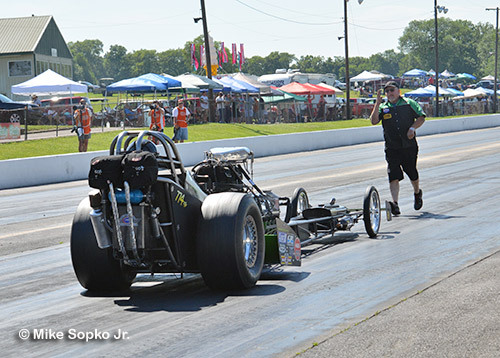 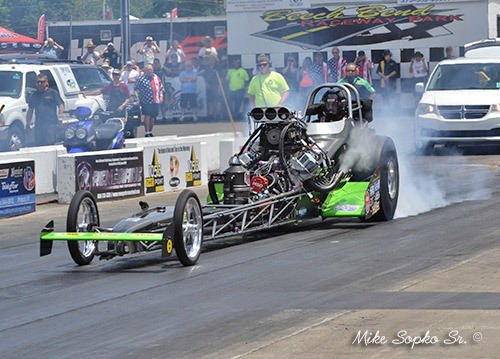 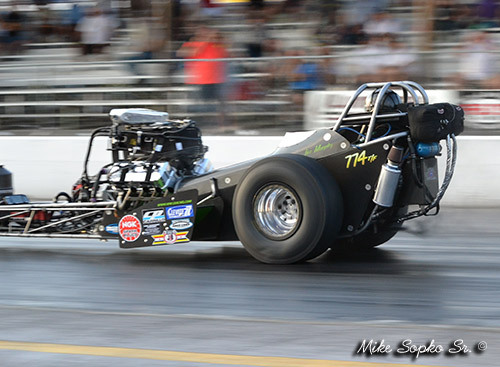 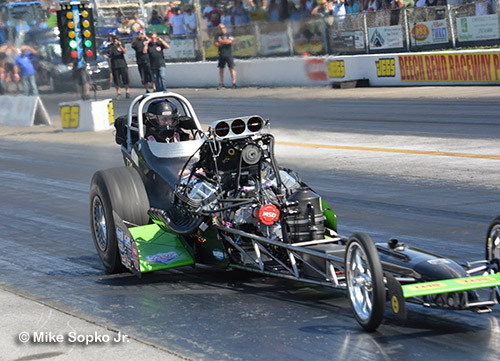 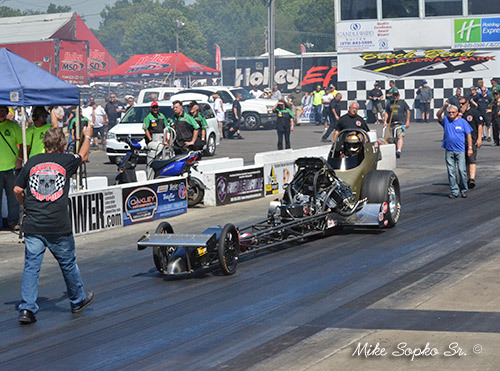 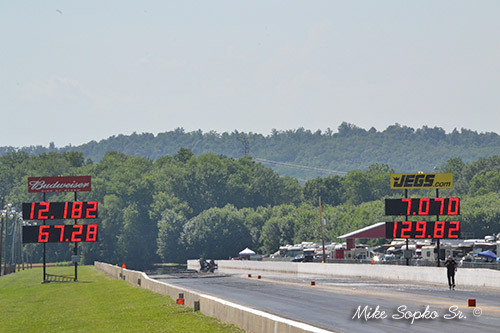 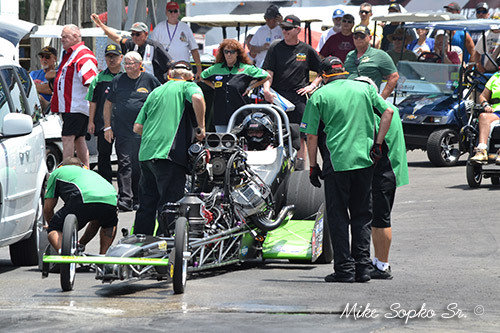 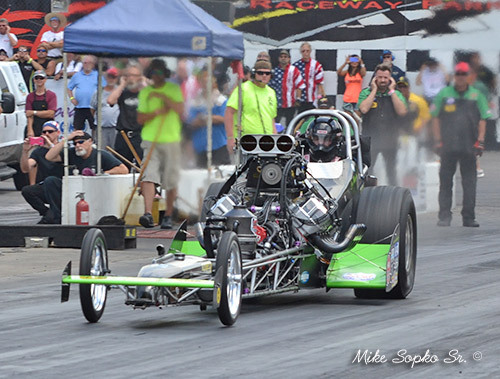 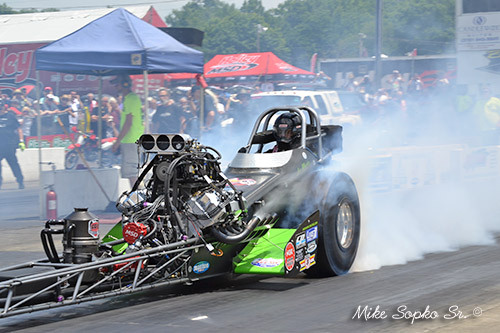 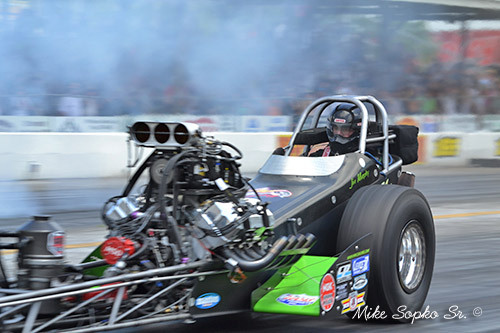 More racing action headlined the final day of the NHRA Holley Hot Rod Reunion presented by AAA Insurance at Beech Bend Raceway with eliminations taking place in all the categories. 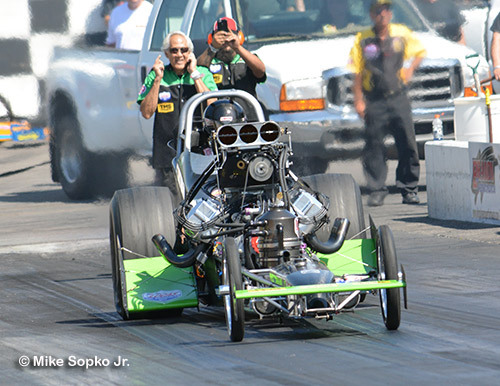 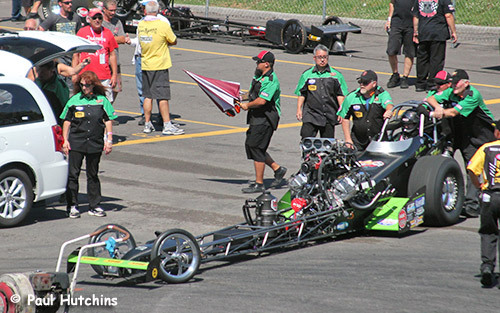 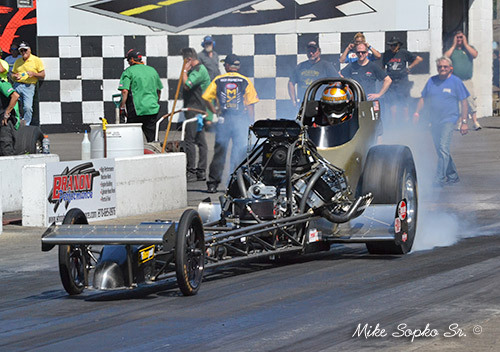 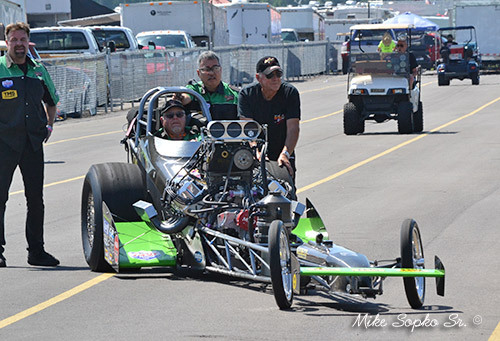 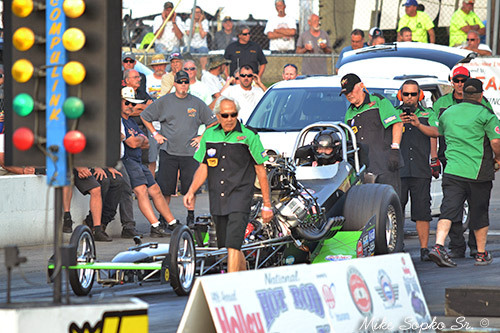 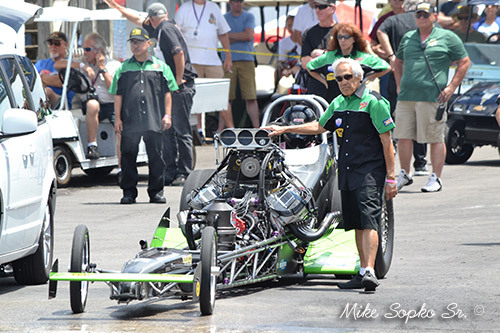 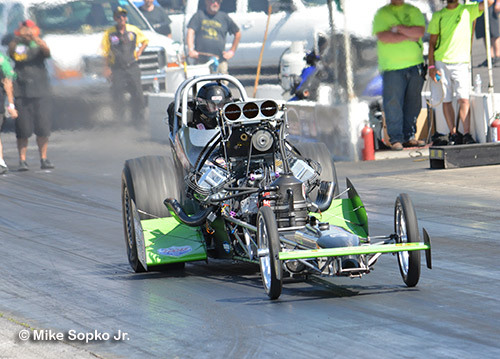 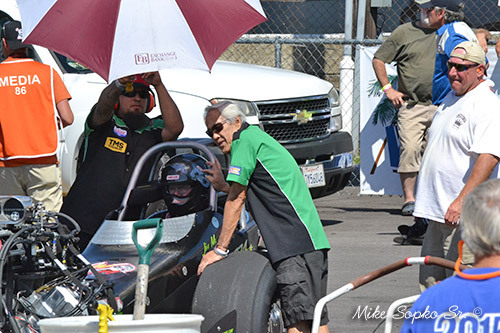 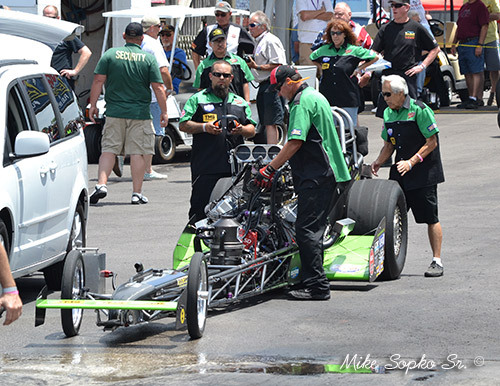 In the signature event, the Nostalgia Top Fuel final pitted west coast racers Adam Sorokin and Jim Murphy. 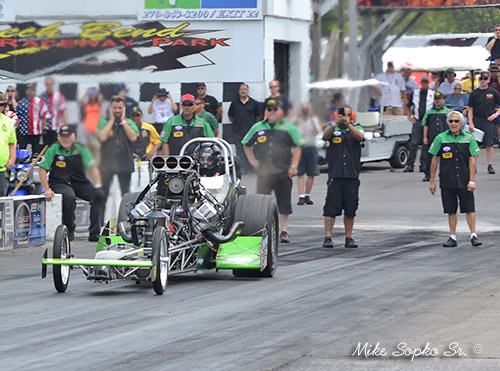 Murphy returned to Kentucky after missing last years event to try to gain more points than the other guys and he almost accomplished that with a runner-up finish. 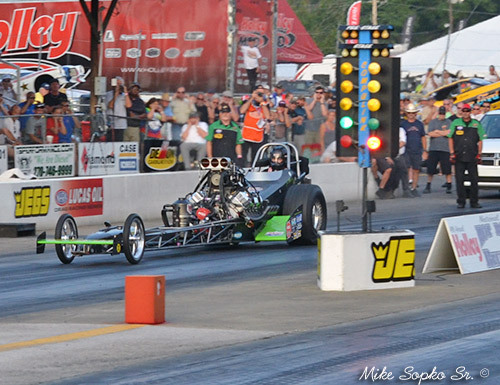 Murphy, tuned by the legendary Roland Leong, put himself in an early hole with a .126 second reaction time to a .062 of Sorokin. 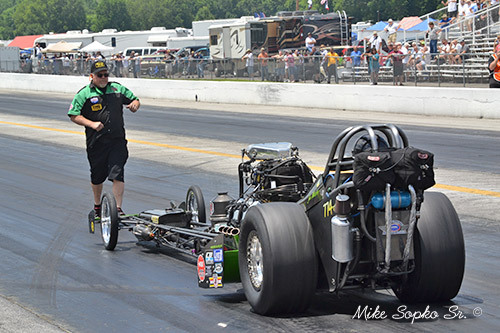 Murphy wandered out of the groove at the 900' mark and had to lift. 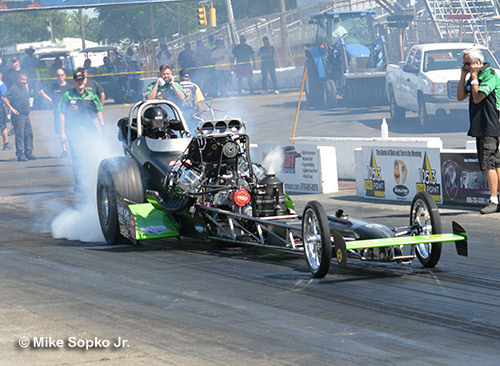 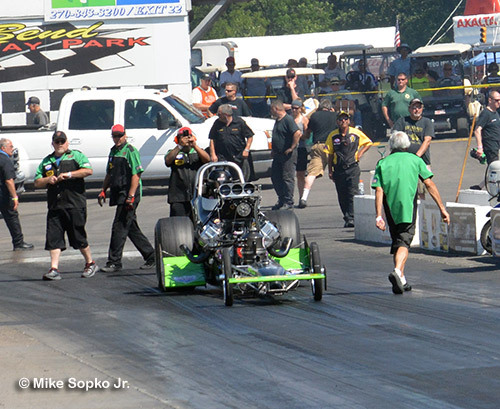 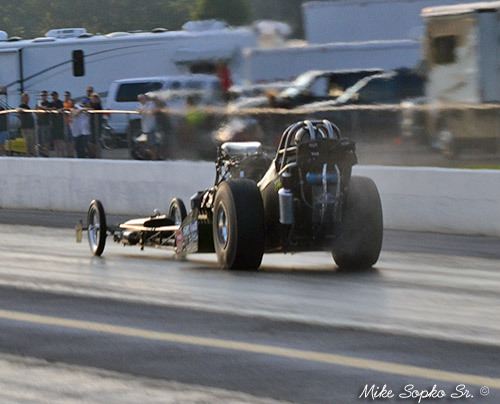 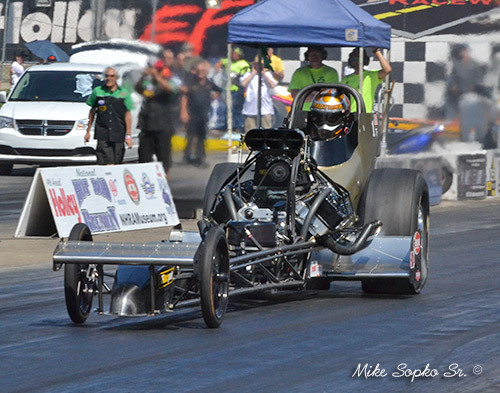 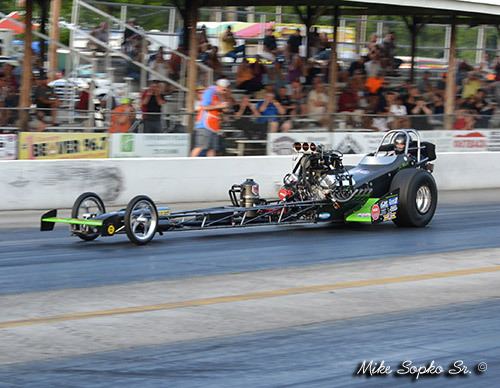 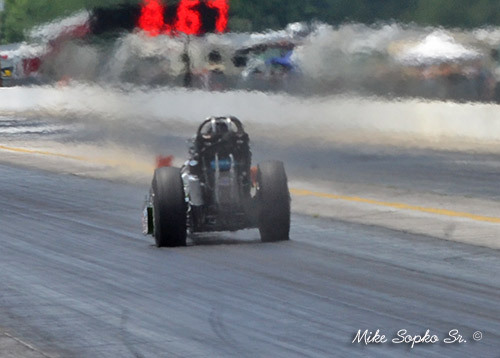 Sorokin in the bright red Champion Speed Shop dragster also got out of the groove but was able to hang on for the win. 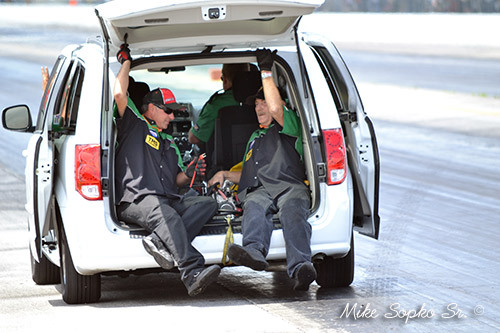 The crew rolled the car into the staging lanes. 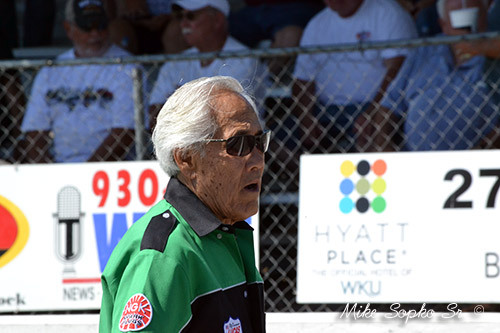 Crew Chief, Roland Leong checking out the track. 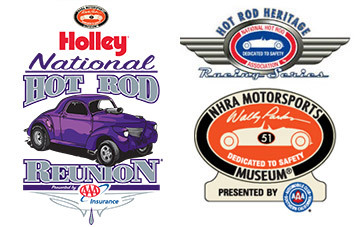 Session one paired cars from opposite sides of the country. 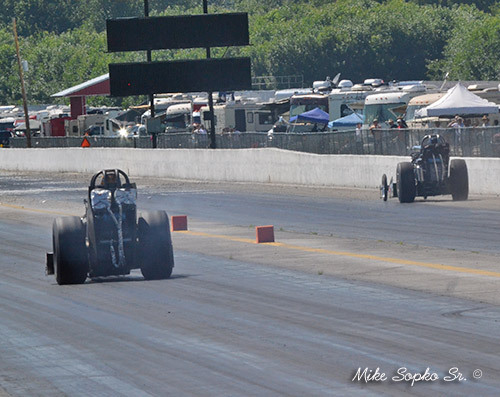 Jim Murphy in his WW2 Racing entry from Santa Rosa, CA vs Tony Bartone from Long Island City, NY in the Bartone Brothers car. 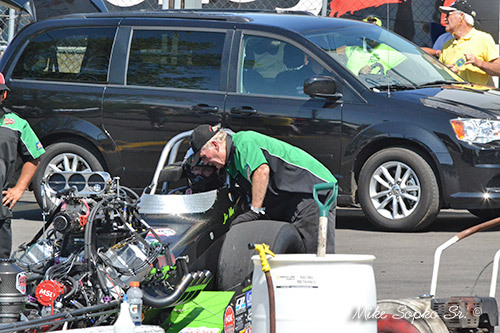 Dan Wilkison ready to fire the engine. 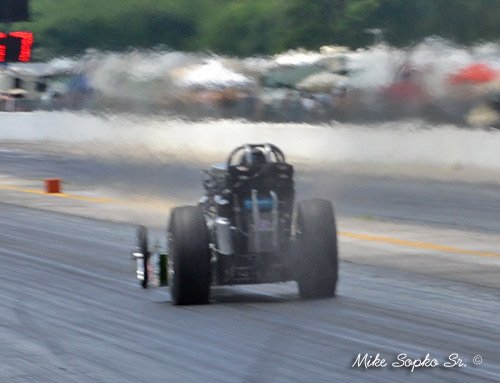 Bartone experienced tire shake and clicked it before the 330' mark. 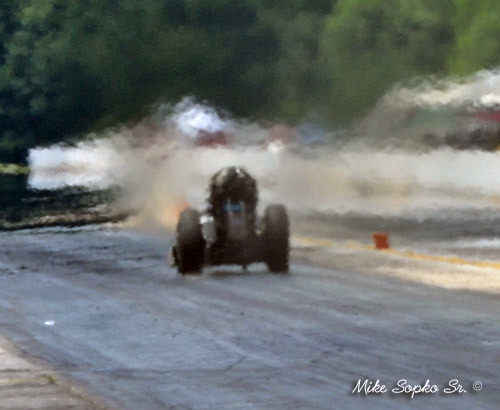 Murphy got out of the groove and close to the wall, end of run. 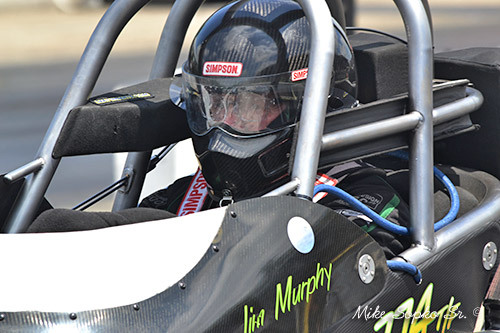 For the Friday early session Murphy was paired with fellow Californian Rick Williamson. 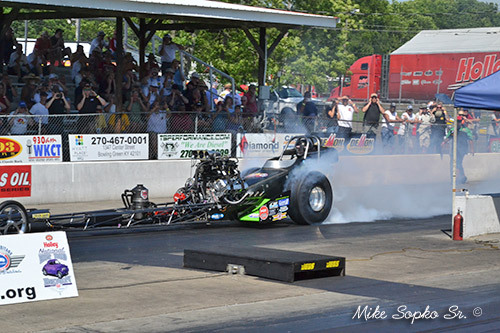 Both cars left good but Williamson started smoking the tires at the tree. 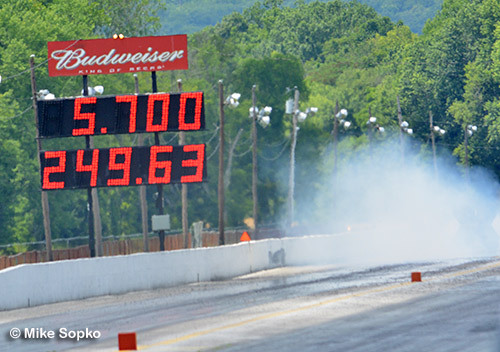 Murphy went to the #4 spot with a solid 5.700. 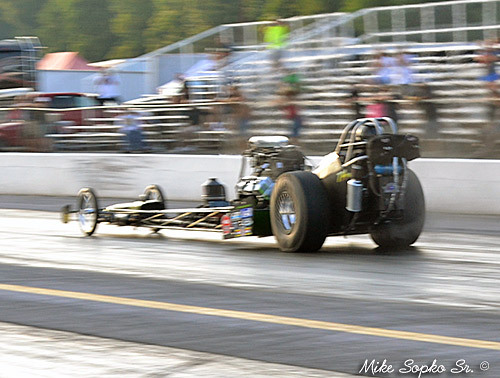 Session 3 found Jim making a single. 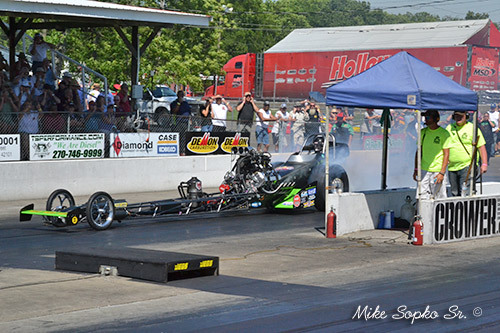 Murphy's 5.856 did not improve his previous 5.700 at 249.63 and stayed #4.